We're joined by a panel to discuss the history of the Baltimore City Fire Department. Rachel Hennick is the author of Ghetto Medic: A Father In The Hood, about her father Bill Hennick's career as a Baltimore firefighter and medic. We’re joined by a panel to discuss the history of the Baltimore City Fire Department. 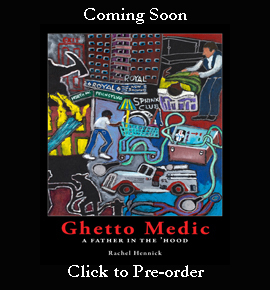 Rachel Hennick is the author of Ghetto Medic: A Father In The Hood, about her father Bill Hennick’s career as a Baltimore firefighter and medic. They join us along with Mark Cottman, artist and poet who created the cover art for Ghetto Medic, Union 964 Secretary/Treasurer Steve Horchar, and Guy Cephas, Curator of the Arthur “Smokestack” Hardy Fire Museum.